We are the most trusted Manufacturers, Exporters & Suppliers of Radial Drilling Machine (SDM-45). 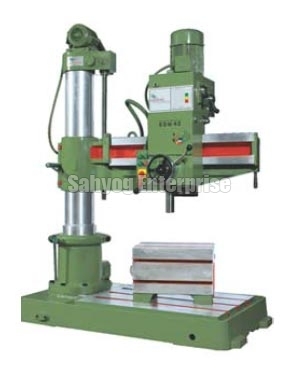 The Radial Drilling Machine (SDM-45) is fabricated by our experts using modern technology and high grade material. The Radial Drilling Machine (SDM-45) is appreciated for its sturdy construction, high operational efficiency and low maintenance cost. Main Spindle made from alloy steel with 6 slots is machined by Hobber machine and MT- Bore is provided internally grinded by internal grinding machine. Wherever provision for lifting up and down to sleeve / arm of machine provided auto cut switches to avoid accidents is provided including other parts as well wherever necessary.